A Russian Soyuz U rocket topped with a Progress cargo resupply craft was moved to its Launch Pad at the Baikonur Cosmodrome in the early hours on Tuesday to enter final preparations for a Thursday evening liftoff on a two-day chase of the International Space Station to keep up a steady supply of cargo for the six crew members in orbit. The Progress MS-04 spacecraft is the first of two cargo missions to ISS planned before the end of the year, the second being the Japanese HTV-6 that is set for liftoff atop an H-IIB on December 9th and a robotic capture on the 13th. 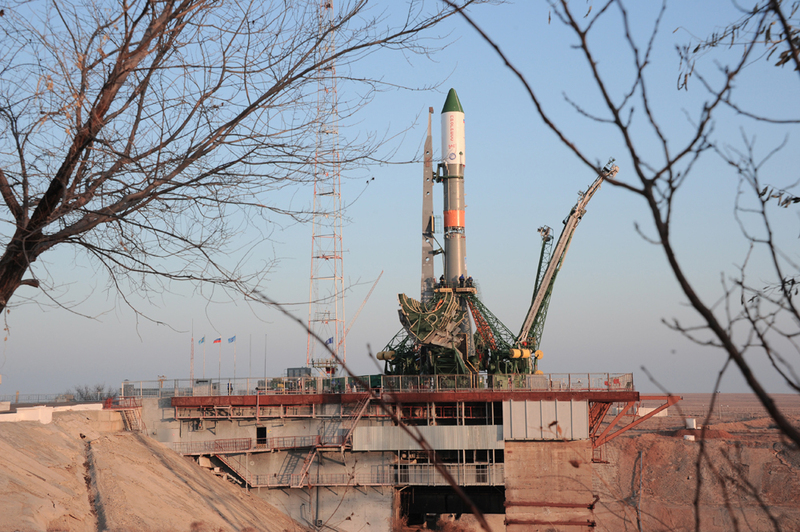 Progress MS-04, loaded with 2,400 Kilograms of food, fuel and supplies, is aiming for liftoff at 14:51:52 UTC on Thursday for a nine-minute climb into orbit atop the trusted Soyuz U rocket to mark the start of a 34-orbit rendezvous with the Space Station. Docking to the Station’s aft port on the Zvezda Service Module is expected at 16:43 UTC on Saturday, kicking off a planned 147-day stay through late April 2017. Thursday’s liftoff will mark the end of a very busy time for Soyuz and Progress operations at the Baikonur Cosmodrome, coming right on the heels of Soyuz MS-03 that lifted off with three ISS crew members on November 17 and Soyuz MS-02 that carried a three-man crew to ISS in October. This fast pace of missions took advantage of a streamlined approach to launch operations at the Baikonur Cosmodrome – the result of decades of experience in areas such as spacecraft and launch vehicle processing for liftoff as well as the pad turnaround process. 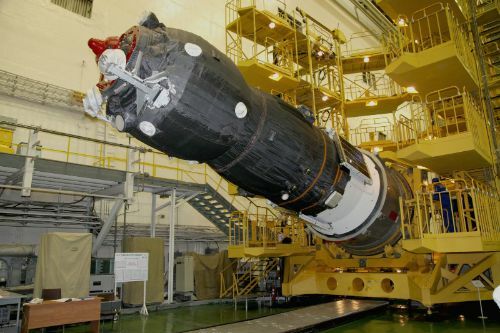 Progress MS-04 entered its final processing campaign in November at Site 254 of the Cosmodrome to be loaded with cargo, undergo final checkouts and complete hazardous processing which entails loading the Progress with propellants and compressed gases. While being readied for launch, Progress MS-04 was inspected by the Soyuz MS-03 crew during one of their visits to Site 254 to have a look at the cargo situation aboard the spacecraft before it arrives in orbit. The fully-fueled Progress MS-04 was returned to the spacecraft processing facility on November 22 to complete a last set of checks before being installed on the payload adapter that provides the structural interface between the launch vehicle, spacecraft and launch shroud. Progress was rolled to a horizontal position on November 25 to be encapsulated in its launch shroud after the last protective covers were removed from the craft’s docking system and navigation sensors. 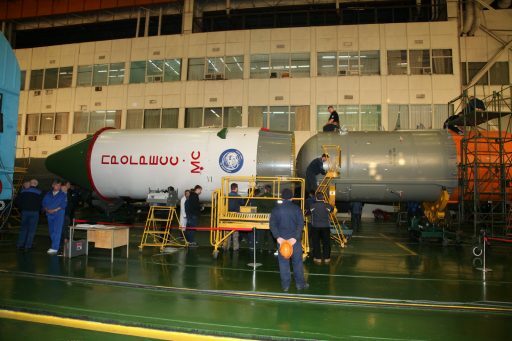 Progress was shipped from Site 254 to the MIK-112 Launcher Integration Facility on Sunday to be ready to meet its Soyuz U rocket. This mission uses the penultimate Soyuz U vehicle that is being phased out in favor of the upgraded Soyuz 2-1A rocket that will take over all Progress launches starting with the MS-06 mission. Soyuz U has been the workhorse of the Soyuz fleet since 1973, launching cargo to Russia’s space stations, lifting crews into orbit, and launching a variety of satellites to all types of orbits – flying more than 780 missions with a success rate of over 97%. 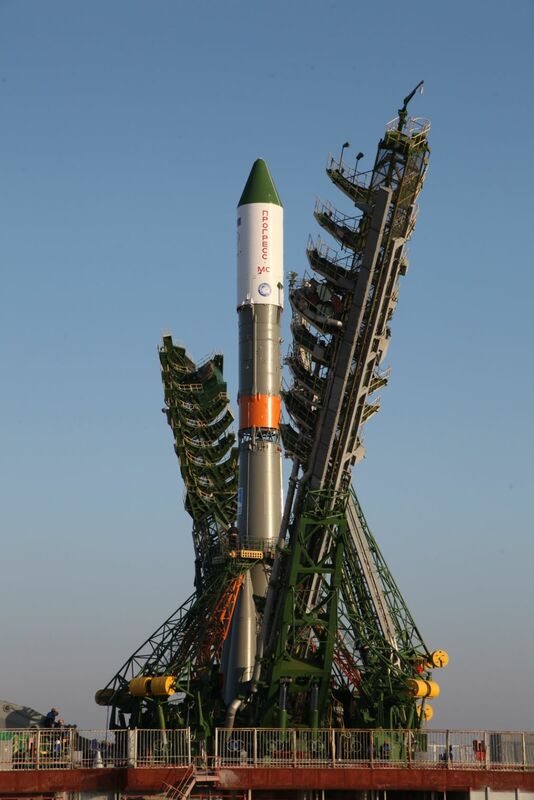 Soyuz U holds the record for the longest operational life of an orbital rocket, the most launches performed by a launch vehicle and the highest launch rate in a calendar year. Production of the Soyuz U was stopped in 2015 and the final flight of the vehicle is currently expected in February 2017. 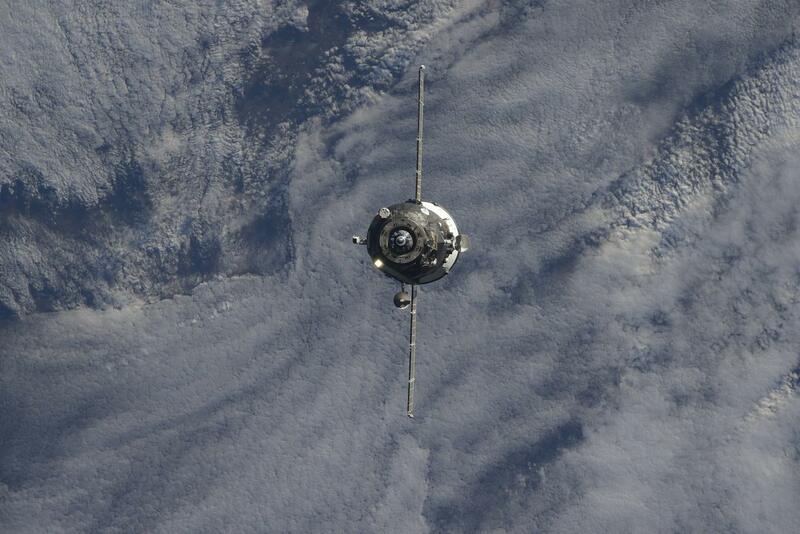 Soyuz 2-1A first flew with a Progress spacecraft in October 2014 to allow some time of overlap between the Soyuz U and the upgraded vehicle in order to iron out any issues with the new launcher/spacecraft combination – a wise choice as became evident in April 2015 when the Progress M-27M spacecraft suffered severe damage due to unforeseen dynamics occurring between the modified third stage of the Soyuz 2-1A and the Progress craft at the moment of engine shutdown. These issues were overcome and Progress MS-01 and 02 flew successfully on the 2-1A version of the Soyuz. 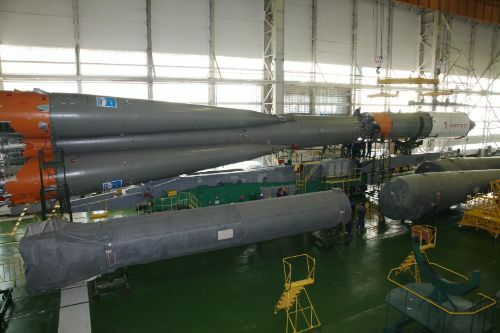 Assembly of the 46-meter long Soyuz U rocket was finished on Monday with the attachment of the encapsulated spacecraft to the Block I stage of the launch vehicle before the upper composite was installed on the core stage of the rocket which had its four strap-on boosters installed earlier. 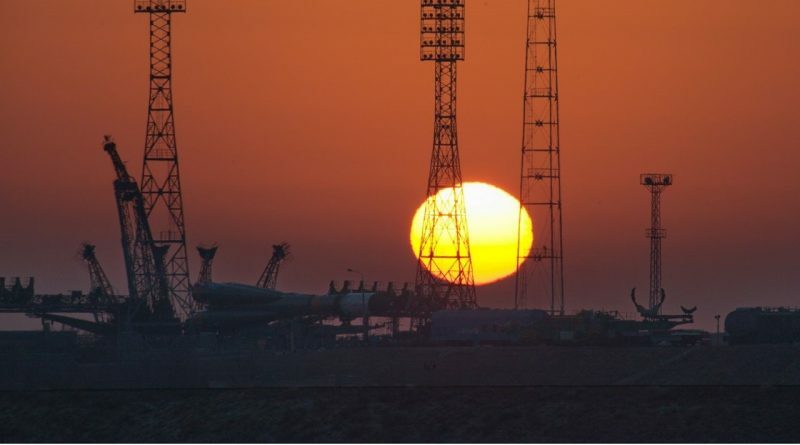 The Russian State Commission convened later on Monday to review the status of launch preparations and provide the green light for the rollout of the rocket. Soyuz U emerged from its assembly building at the traditional early morning hour, being wheeled to Site 1/5 of the Baikonur Cosmodrome at dawn on a cold winter morning in the Kazakh steppe. 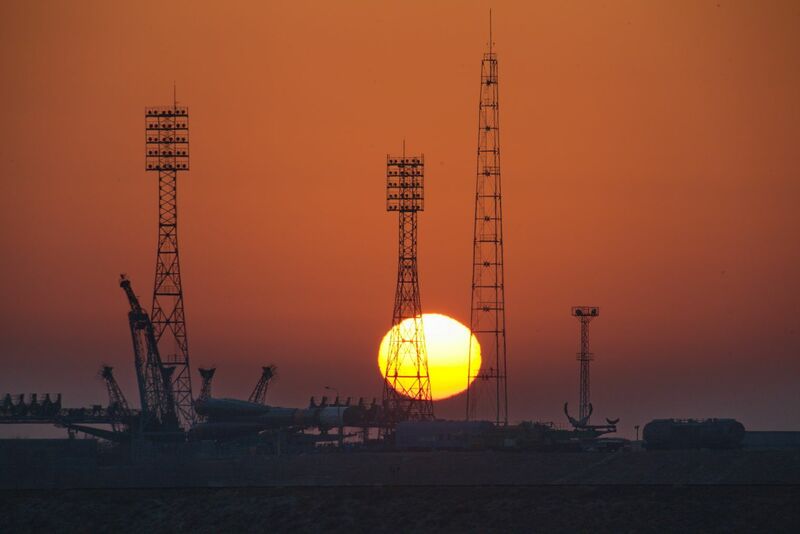 The sun rose over the launch complex before Soyuz U was raised to its vertical liftoff position and the two halves of the Service Structure were moved into position to provide access platforms to engineers. Connected to its various propellant and electrical umbilicals, Soyuz U is set for a full day of testing on Wednesday before heading into an eight-hour countdown on Thursday, setting up for an 8:51 p.m. local time liftoff. 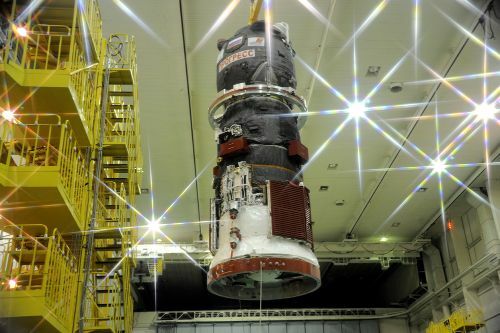 With countdown clocks ticking down, Soyuz will undergo final physical reconfigurations as engineers install batteries on the launch vehicle and remove protective covers from the booster and core stage engines to prepare for the start of propellant loading. 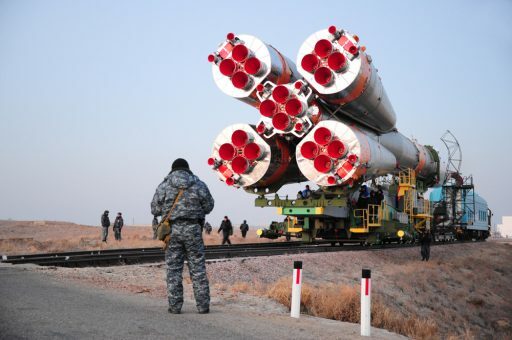 Picking up four hours prior to launch, the 12 tanks of Soyuz U will be filled with 274 metric tons of Kerosene and Liquid Oxygen while the vehicle also receives Nitrogen to act as tank pressurization gas and Hydrogen Peroxide to drive the engine turbopumps. The insertion of the Launch Key at T-6 minutes will mark the start of a highly choreographed countdown sequence to transition the 313-metric ton rocket to its fully autonomous launch configuration. Soyuz will soar to life at T-20 seconds when spinning up its engine pumps and firing igniters to allow the RD-117 booster engines and the RD-118 on the core stage to roar to a collective liftoff thrust of over 400 metric ton force – overcoming counterweights to lift the rocket off the ground. Soyuz U will ascend vertically for only a few seconds before pitching over towards a north-easterly departure to deliver the 7,300-Kilogram Progress spacecraft into the orbital plane of the International Space Station. The four boosters will operate until T+1 minute and 58 seconds, helping Soyuz accelerate to a speed of 1.5 Kilometers per second before dropping away after each consumed 39,600 Kilograms of propellants. Relying on its core stage alone, Soyuz U will continue powered flight with a vacuum thrust of 102 metric-ton force as it departs the dense layers of Earth’s atmosphere. Passing through 85 Kilometers in altitude, Soyuz will split open and jettison its launch shroud two minutes and 39 seconds into the flight as aerodynamic forces will no longer be able to harm the Progress at this stage of the flight. The Core Stage finishes its job four minutes and 45 seconds into the mission, marking the start of the hot staging sequence. Two seconds after shutdown on the core, the RD-0110-powered Block I stage will command its engine to fire followed moments later by the pyrotechnic separation of the 27.8-meter long Core Stage that will impact 1,500 Kilometers from the launch site. Generating a thrust of 30,400 Kilogram-force, the Block I stage will be tasked with a burn of three minutes and 58 seconds to push the Progress MS-04 spacecraft into an orbit of 193 by 245 Kilometers, inclined 51.66 degrees. Separation of the Progress spacecraft is planned eight minutes and 49 seconds after launch to mark the start of a series of time-tagged commands that will deploy the spacecraft’ s solar arrays and KURS navigation antennas followed by the pressurization of the Unified Propulsion System for active attitude control as the spacecraft embarks on its first orbit around the planet. Like all previous flights of the MS class, Progress will stick to the two-day mission profile for docking to ISS after 34 laps around Earth. Per the standard mission profile, Progress will fire up its main engine twice on its third orbit around Earth to raise its orbit – chasing down ISS from behind and below. These maneuvers are adjusted after launch based on the initial insertion obit of the craft to deliver Progress to an orbit over 300 Kilometers in altitude with a third burn on orbit #18 that sets up the proper parameters for rendezvous. Progress MS-04 will initiate its Automated Rendezvous on Saturday to complete another ground-targeted burn before beginning relative navigation using the upgraded KURS-NA radio navigation system to guide itself into the vicinity of the Space Station for a flyaround ahead of a straight-in approach to the aft end of the Zvezda Service Module. Copyright © 2019 Progress MS-04 | Spaceflight101. All rights reserved.